I had so much fun recording this morning. It was my first official video filming with my Canon 600D and the amount of time I pulled faces and laughed at myself through the little screen on the side. I swear I filmed for almost 2 and a half hours and three quarters of it was me making funny gestures and laughing at myself which i haven't done in quite awhile but made filming a fun little thing this afternoon. 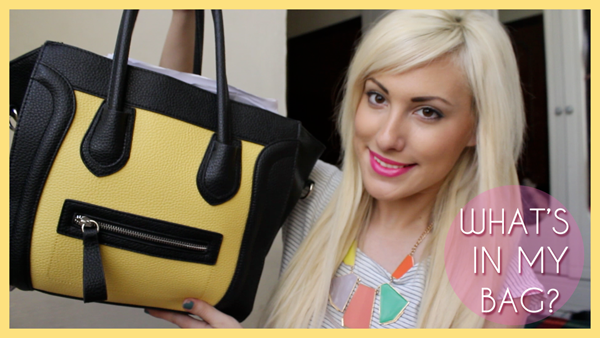 I wanted to film a What's in my Bag Tag for quite awhile now and it's one of my favorite things to watch on YouTube! I have been seeing those gorgeous Ted Baker Wash Bags in YouTubers bags at the moment and I've got my eye on either the Pink or the Green one actually, aren't they just so cute?! I honestly carry a lot of junk in my bag as you could see. Papers (Secret ones) which i will be able to reveal hopefully by July (Fingers crossed) as I do not want to jinx anything but I have some exciting news for you all very soon. Apart from that I carry 3 yes 3 Diaries/Notebooks, I love writing and I always need a pen and paper where ever I go! Wallet is my favorite of them all as It is unique and only 5 others own an identical yet different coloured wallet like mine. Why you may ask? Cause I made them! I was obsessed with studded purses and never found exactly what I wanted to I bought 6 or 7 wallets in different colours and kept this Orange one for myself. Let's put it this way, I can easily find it in my bag since the colour is quite striking. I hope you enjoy the video as much as I had such an amazing time filming again! I am going to film again Tuesday so I am thinking of having one up every Friday or Saturday, I need your feedback to what you think about this. Go Subscribe, Like and Comment; You'll make my day 100x Better !